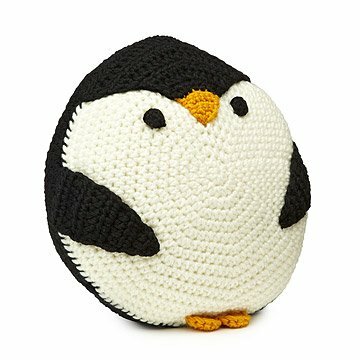 This plump, crocheted penguin is sure to waddle into the hearts of both kids and grownups alike. Whether she's sitting sweetly on your couch, snuggling with you as you take in your favorite show, or propped behind your head as you read your latest page turner, this adorable Antarctic bird is sure to warm up any room. 100% hand crocheted by highly experienced craftspeople in China. 4.5" H x 13" Dia. Flammable. Keep away from source of ignition. I Loved it and it is a cutie!!!!!!!!!!!! My niece loved the gift. And that's all it matters. It's the perfect size, and isn't rough as knits can be. It's cute, and functional for a little girl to grow with. Perfect house warming gift for our Penguin loving niece! Wife loves collecting penguin stuff. Loved it when she unwrapped and hasn't left her side since. I bought this for a good friend who loves penguins. She was thrilled with it! It is very attractive with excellent details, soft and cuddly. Well worth the cost, it is a high quality product that has a home made look. Great gift for the penguin lover. A bit pricey, but super cute. This plump, crocheted penguin pillow is sure to waddle into the hearts of both kids and grownups alike.